Almost two weeks after calling into question the citizenship status of almost 100,000 registered voters, Texas’ new chief elections officer, David Whitley, defended his office’s decision to hand over those voters’ names to law enforcement even though he knew the list could contain mistakes. “I can tell you, senator, that 100 percent my reason for transmitting this data to the attorney general’s office was to ensure that these lists were as accurate as possible,” Whitley said to state Sen. Kirk Watson, D-Austin. 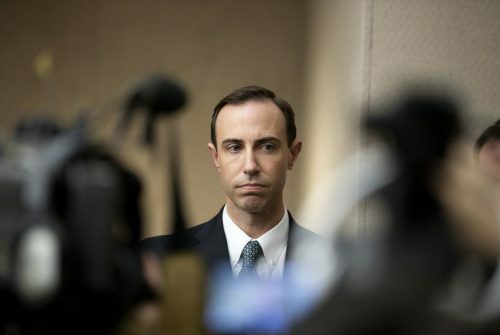 Whitley has faced intense scrutiny of his decision to send Texas counties lists of registered voters who told the Department of Public Safety they were not citizens when they obtained a driver’s license or an ID card. Several Republican state leaders, including Attorney General Ken Paxton, quickly proclaimed that the number of names on the list indicated widespread voter fraud. But Whitley’s review of the data did not account for people who became naturalized citizens — and then legitimately registered to vote — after receiving those documents. Driver’s licenses don’t have to be renewed for several years, and naturalized citizens are not required to update DPS on their citizenship status. The citizenship review effort buckled within days after Whitley’s office quietly told local elections officials it had mistakenly flagged U.S. citizens who had registered to vote at DPS offices. Local elections officials have also identified other naturalized citizens on their lists who had registered to vote elsewhere. Since then, several voters who were naturalized after obtaining their driver’s licenses have also confirmed they are on the state’s list. Despite acknowledging his office knew the list could contain mistakes, Whitley repeatedly brushed off Democrats’ questions about the list erroneously including tens of thousands of U.S. citizens. Whitley is already a named defendant in three lawsuits Texas now faces over its citizenship review efforts. Naturalized citizens, civil rights groups and voting rights advocates have asked federal courts in San Antonio, Corpus Christi and Galveston to block the state from flagging voters for citizenship review, which they allege is unconstitutional and violates federal safeguards for voters of color because it imposes additional burdens to register to vote on naturalized citizens. Republican Gov. Greg Abbott appointed Whitley to the position Dec. 17, but the Senate didn’t immediately confirm him because the Legislature was not yet in session. If his nomination makes it out of the Republican-dominated nominations committee, he’ll need a two-thirds majority among the lawmakers present when the full Senate votes. Republicans are in the majority in the 31-seat chamber, but Whitley will require at least some Democratic support unless several senators are gone the day of his vote. The committee won’t vote on sending Whitley’s nomination to the full Senate until next week, but his path to confirmation remains rocky. Three Democrats serve on the nominations committee, and three others dropped in to question or raise concerns about Whitley’s botched citizenship review efforts. All seemed hostile — if not explicitly opposed — to the nomination. In one awkward exchange, state Sen. Royce West, a Dallas Democrat, asked Whitley to define voter suppression. “I think it’s irrelevant,” Whitley responded. Even some of the Republicans on the committee seemed to question Whitley’s rollout of the citizenship review efforts. “I would say maybe some of that should be tempered,” she said. State Sen. Kel Seliger, R-Amarillo, asked Whitley about the DPS data his office used to draw up the flawed list of voters. But the secretary of state was largely unable to address Seliger’s questions about the process. “Can my name get on that list?” Seliger asked. “I don’t know, senator,” Whitley responded. This entry was posted in KRTS News and tagged Secretary of State, Whitley. Bookmark the permalink.